Latest from the Storm Prediction Center: A tornado watch will be issued by 4 p.m. across portions of the mid-South. A few strong tornadoes are possible in addition to large hail. 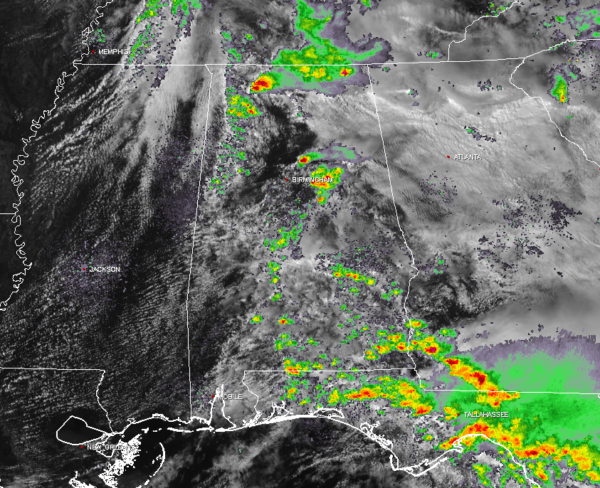 Clouds are breaking up across central Alabama, which is not good news. Temperatures have soared into the 70s and dewpoints are climbing through the 60s. The dewpoint is up to 69 at Tuscaloosa and 64 at Birmingham. A little upper-level disturbance is passing eastward along the I-20 corridor. It triggered a severe thunderstorm warning for northeastern Jefferson County a little earlier. Instability values have climbed to more than 1,500 joules/kg over all but northeast Alabama. There is very strong bulk wind shear, allowing storms to organize quickly. Lapse rates are over 6.5 C/km, allowing for strong updrafts to form quickly. Significant hail parameters are high, meaning hail over 2 inches is possible. Helicity values are beginning to come up over the western half of central Alabama, already over 150 m2/s2 approaching 200 m2/s2 in many spots in the counties bordering the Mississippi state line. Significant tornado parameters are over 1 over the western two-thirds of the state now, with values over 2 in almost all areas west of I-65. A tornado warning was in effect until 2 p.m. for parts of Colbert County in northwest Alabama. That storm has weakened. All signs point to a significant threat of severe weather continuing through the afternoon. Any storms that form this afternoon will rotate and become severe quickly. They will have hail and lightning as well, and could produce damaging winds. There will be an increased tornado threat as low-level shear values rise over the state through the late afternoon and evening. For frequent, area-specific weather updates, visit AlabamaWx.